The Holiday Bell™ will bring a warm smile to your callers, whether they are family, friends or neighbors. The deep gold windcatcher has in-scripted the word 'Peace' within it. Peace has a tremendous meaning to each and every one of us in these days & times! Each bell is constituted of more than 60% recycled steel, handcrafted on the coast of Maine and proudly made as being a Green Company! 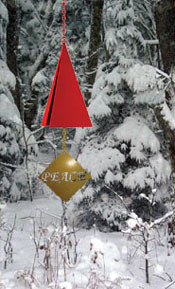 The Holiday Bell is 10 inches in length, with the windcatcher adding another 10 inches at the bottom. Click on play bitton to hear it.